If you want to investigate or just own a real haunted doll. Then Please, buyer Beware! All The Information On Real Ghost Or Actual Demonic Possession Of Toy Baby Dolls That You Really Need To Know If You Want to Buy and investigate A Real Haunted Doll! By now many people are aware that real haunted dolls do exist to some degree. Many believe the tales lay rooted in some deep dark truth somewhere that dolls can come to life. And that they too can or might become possessed or haunted by ghosts and demons for what appears to be no apparent reason. Have you seen the warning on an Ebay haunted doll listed that reads like this. THIS REAL HAUNTED DOOL IS NOT TO BE OWNED BY A CHILD OR PERSONS WITH MENTAL INSTABLITIES. THIS VERY REAL HAUNTED DOLL SHOULD BE OWNED BY SOMEONE WHO UNDERSTANDS ALL THINGS AND INVESTIGATES GHOSTS SENSIBLY. 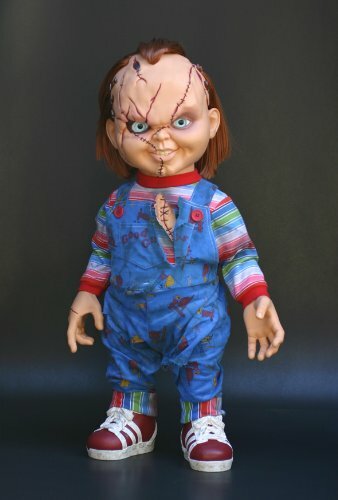 AND ONE NEEDS TO FULLY INVESTIGATE THE SELLER AND UNDERSTAND WHAT THEY WILL BE RECEIVING AND WHAT COMES ALONG WITH THIS THE MOST UNIQUE HAUNTED DOLL BEFORE THEY BUY IT. Many bizarre beliefs are associated with actual real haunted doll phenomena. Here below is a list of real reported haunted doll paranormal activity. How to Tell If Your Doll Is Really Haunted By A Ghost Or A Demon. Ghost Speaking Dolls will sometimes call out your name in the middle of the night so loud it awakes you. Haunted dolls often will curse or use foul language on EVP's. The easiest way to collect haunted doll EVP is to leave your doll alone in a room with the recorder running when no one is home. The same applies to haunted dolls lifelike that move, stand, walk cry, or disappear through paranormal occurrences. If such activity is captured on taped then you might just prove the world that Ghosts and the science of hunting them is a real science. Speaking haunted dolls sometimes speak in hushed whispers. Some haunted dolls with speaking mechanisms will sometimes make the mechanism sound a noise unexpectedly. Often people will tell you of real old antique haunted dolls with music box's inside them that will play mysteriously at strange times, and that these are a sign that a doll is really haunted. The same applies for dolls that seem to disappear only to be found in a location you know it was not in. Many web sites and blogs will tell that a "real haunted Ghost Dolls" are nothing more then the reflections of an over active imagination or of a past we are unwilling to depart from. Some believe their haunted dolls have a secret life of their own into some strange vortex they travel. Haunted dolls are often known to blink or wink at people. And some have even been known to emit strange smells of exotic far away places. Though the haunted scents sometimes happen in all types of hauntings not just haunted dolls exclusively. Recently some one asked me I could investigate whether or not Alien or Extraterrestrials beings could be influencing haunted dolls to do the things they do to living people. Many haunted dolls are known to play psychological games on their owners. Some just sit on a shelf for 1- 10 years before it ever does the paranormal activity that you will witness. Paranormal investigators often report in youtubes how many haunted dolls effect electrical equipment and cameras. They have been know to stop watches, break camera, destroy film, drain batteries and even mesmerize people are haunt those who just stare at even their photos. Many relate the belief in haunted dolls and the obsession of them to Pygmalion the great legendary figure of Cyprus. Though Pygmalion is the Greek version of the Phoenician royal name Pumayyaton, he is most familiar from Ovid's Metamorphoses, X, in which Pygmalion was a sculptor who fell in love with a statue he had carved. In Ovid's narrative, Pygmalion was a Cypriot sculptor who carved a woman out of ivory. According to Ovid, after seeing the Propoetides prostituting themselves, he was 'not interested in women', but his statue was so realistic that he fell in love with it. He offered the statue gifts and eventually prayed to Venus (Aphrodite). She took pity on him and brought the statue to life. They married and had a son, Paphos. Some of those in the field of Paranormal research might conjecture here that statues or replicas of living beings. And since they resemble real living humans it is as some ghosts or unseen forces see it as an empty shell of a body that they can easily openly habituate, mentally control and possess just as a living body might be posed in the same way. Another thought put forth by many a paranormal scholar is that it is just a home a ghosts or real demon just moves into. The actual paranormal phenomena uses the doll as as focal point to scare the living. In disposing or getting rid of such evil Dolls many paranormal groups preach that they believe by destroying such a doll the haunting will end. The same as destroying a Ouija board by fire or blessing it with holy water to exorcise the spirit from the doll. But many will tell you they destroyed the doll, or sold it or locked it away and the haunting got worse. The real honest reason that dolls become haunted with spirits is still very much in debate. Whatever puts life into these empty shells in the first place has it's own reasons for going there and also leaving when it is ready to leave. The story of the breath of life making inanimate objects come to life is often recanted in a ancient tales of haunted or magical statues, living toys and specific bodies such as zombie dolls to house the spirits to do ones biddings. And many artist would love nothing more then their weird and wonderful creations to come to life. One must parallel in the examples of Daedalus, who used quicksilver to install a voice in his statues; of Hephaestus, who created automata for his workshop; of Talos, an artificial man of bronze; and, according to Hesiod, Pandora, who was made from clay at the behest of Zeus. The moral anecdote of the "Apega of Nabis", recounted by the historian Polybius, described a supposed mechanical simulacrum of the tyrant's wife, that crushed victims in her embrace. The discovery of the Antikythera mechanism suggests that such rumored animated statues had some grounding in contemporary mechanical technology. The island of Rhodes was particularly known for its displays of mechanical engineering and automata - Pindar, one of the nine lyric poets of ancient Greece, said this of Rhodes in his seventh Olympic Ode: "The animated figures stand Adorning every public street And seem to breathe in stone, or move their marble feet." The trope of a sculpture so lifelike it seemed about to move was a commonplace with writers on works of art in Antiquity that was inherited by writers on art after the Renaissance. Many believe that dolls or statues can become possessed by the magical influences of witches, necromancers and those adept in the occult. Such Might be the case of Robert the most famous Haunted doll in the world, or the strange haunted Demon From Hell possessed Voodoo hoodoo doll in the possession of The Great American Necromancer Lisa Lee Harp Waugh. Many have believed that a person can will themselves or their souls into a real doll or inanimate item such as a toy or for many centuries. Possessed by ghost items go probably back to the days of the caveman. The belief that a doll could be caused to become possessed by a form of a real black magic spell, voodoo hoodoo, or Gypsy could cause such items to come to life. Many times the evil curse or or ju-ju magic is to exact some sort of revenge on a living person. Others curse might deal with the damnation of locking a lost soul or ghost into a manufactured body only to keep it from haunting the living. Many would be paranormal investigators and those of high respect often search on ebay to find the most perfect haunted doll to study to prove that such things can become haunted. And as we all know not every doll out there is as haunted as the claims of the owner might be. Besides the out right frauds and over active imaginations there or those that try to sell wish dolls, Fairy haunted dolls, and those possessed by evil demonic forces. They might find an old discarded doll at the Salvation Army every week and put it up for sale just to take advantage of the gullible person who wants so desperately to own a real haunted doll. Another school of thought is that these for real haunted dolls become possessed by their former, now dead, past owners. Pre-owned objects some paranormal investigators will state,or too to often carry with them the essence of the person or persons they belonged to. And many have the actual belief that such things as antique handmade porcelain faced or life cast head infant dolls can take on the persona of evil into itself, but for no other reason then to torture it's new owner to the point of insanity. And in some cases that is by proving to the new owner they are not haunted at all. Some haunted dolls may actually produce paranormal phenomena for a owner and not for others. Many who buy what are supposed to be real haunted dolls on Ebay or haunted doll web sites often complain that the doll they bought is not haunted at all. where as the doll is passed onto another who might state that it is the real deal. Because the spooked out doll has shown high levels of paranormal activity to them and not the former owner. A poignant point and actual thought on this is that some haunted dolls do not like their owners and might just want to move on to someone they really can scare and control by their actions. Some objects many haunted people believe can often hold a strange unique and oh so powerful spell of revenge. Many think that is the case of such haunted dolls like Robert or the possessed voodoo hoodoo doll. Across America there are some dolls about which there is no doubt, at least in everyone’s mind: they are most definitely haunted. As interest in haunted dolls and actual possessed demonic playthings keeps rising, it might be well to review these real LIVING DOLLS. Probably the most famous haunted plaything ever, Robert is a doll that now resides – happily, they say - in The East Martello Museum in Key West, Florida. Many who have come in contact with Robert say that If he dislikes you, or in someway you offend him, he will cause you to dream a lucid dream of him the next night. There are a number of stories about the nanny, obviously the pivotal figure in this doll drama. Many say that, although she dearly loved young Gene, she was mistreated and abused by his parents on a regular basis. Some versions of the tale have the nanny practicing the dark Voodoo arts and giving the doll to Robert out of revenge for her ill treatment, but there is nothing to support this being the case. I have heard also from a woman in Key West who says she communicates with Robert daily through the use of ESP. And that he told her personally that he is a doll haunted by a neglected girl who starved to death. Evidently, Gene received the doll, said to be a replica of him, as a gift of love. He promptly named it Robert. As time went by, the Otto's grew older and each, in turn, died, leaving the adult Gene – and Robert – to live in the house. They spent several years there alone until Gene ultimately met and married a local socialite and took her home to live. From the moment she arrived, the creepy doll disturbed the new Mrs. Otto and eventually she prevailed upon her husband to put it away. Robert was relegated to rooms in the attic, where he was to remain – mostly – for the rest of Gene Otto’s life. Robert the Doll, still clad in one of Gene Otto’s sailor suits and clutching a small teddy bear, can be visited at The East Martello Museum and, in October, at the Historic Custom House in Key West, Florida. See Robert the Haunted doll your submitted strange Ghost Photos Visit Here Now! There is a legend in Old New Orleans about the Devil Baby of Bourbon Street, the monster child of a Creole doyenne, adopted by Voodoo Queen Marie Laveaux and christened by Madame LaLaurie. The baby lived to plague the French Quarter and its environs for several years, though some say it still exists, at least in ghostly form, haunting the narrow streets and alleys of the old city. Some others claim that its tiny bones are moldering along with those of its Godmother Marie Laveau in her famous tomb in St. Louis Cemetery No. 1. These early, hand-carved Devil Baby dolls are extremely rare these days. Those families in possession of such an heirloom usually have kept it hidden and have passed it down through generations, so it is hard to estimate just how many of these little effigies were in circulation. In the early 20th century, however, other versions of the dreaded Devil Baby doll began to appear in and around New Orleans. 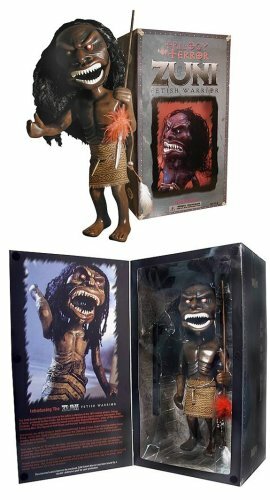 These renditions were more doll-like, clothed in children’s garb and able to stand on their own, with a stuffed body and arms that moved slightly. The face of the Devil Baby dolls was always the same, with leering, glassy eyes and small horns protruding from the forehead. It was said that these dolls had faces that most closely resembled the actual Devil Baby; this was verified by a woman who had evidently played with the Devil Baby as a child. New Orleans real hoodoo Voodoo dolls are the first dolls to truly have a “haunted” reputation. They were a “black market” item in old New Orleans, and in order to obtain one it was necessary to be well connected among secret sosyetes and practicing vodoun community. As bad luck seemed to follow the dolls – some claim because of a curse laid on them all by Marie Laveau – none of them seem to have survived this period. Only parts of one doll remained and these had been locked away until very recently. Recently for stories about the Devil Baby posted on Haunted New Orleans and Haunted America Tours in 2004-2006, local artist and Mardi Gras parade designer Ricardo Pustanio was able to obtain the remnants of the last known surviving Devil Baby doll (c. 1900’s). From these he was able to recreate the doll, adhering to the size and style of the original, for use in the Haunted site stories. These new Devil Baby dolls are full-size, exact replicas of the turn of the century dolls produced in old New Orleans, and, like their predecessors, there is something not quite right about them. The handmade, sculpted dolls seem to have taken on a life of their own. Their eyes seem to follow you as you are moving about the room near them, and when they are gathered together there is sometimes the sound of whispering and rustling among them. Since the dolls were constructed with no real magical intent, the fact that they seemed to be animated by some otherworldly agent made Pustanio curious to see what would happen if he separated them. Even though no one likes having the Devil Baby dolls around, Pustanio was able to convince a few of his friends to each take one of the dolls for safe keeping. It wasn’t long before Pustanio’s friends began to complain about having the dolls and all were anxious to return them. Evidently, even separated there is something devilish about the Devil Baby dolls. One person claimed that the Devil Baby doll he was keeping moved on its own when no one was there. It was housed in a spare bedroom closet and each day when the unwary keeper returned from work, the closet door would be ajar and the Devil Baby would be lying halfway out, sprawled on the carpet. Another of Pustanio’s Devil Baby dolls apparently “got loose” at night in the home of a couple who was keeping it, overturning ashtrays and littering the kitchen floor with beads from a bead-making craft kit nearby. The couple had no pets and no children; there was no other explanation for the strange occurrences. A third Devil Baby doll was placed with famous psychic Reese at his new home in Lakeview in the days before Hurricane Katrina. Reese, a collector of rare dolls, immediately disliked the Devil Baby but reluctantly agreed to keep it. In the two weeks he had it he was continuously awoken in the night by the sound of a baby crying. By the end of the second week of the doll being in his home, Hurricane Katrina struck flooding the house with 7 feet of murky water. When Reese returned to his devastated property he was disturbed to find that the Devil Baby doll was one of the only things missing from the inside of his home. Sylvia Cross, a paranormal investigator who specializes in possessed objects, bought her Devil Baby doll directly from Pustanio online. She thought it would be the perfect addition to her collection of spooky dolls; little did she know she had purchased the real thing. In a short time, she observed changes in the doll’s position from morning to evening; she reported the sounds of snuffling and crying coming from near the baby; and she also related that her two cats would not go near the doll, refusing to even be in the same room with it. “Some objects,” said Cross, “are just ‘born,’ for lack of a better word, with a dark soul. I think the Devil Baby is one of those objects. If you look into its eyes you can almost discern the flicker of a trapped, unhappy soul.” Others believe the glimmer is put there by the Devil himself and that he claims every incarnation of the Devil Baby as his very own. 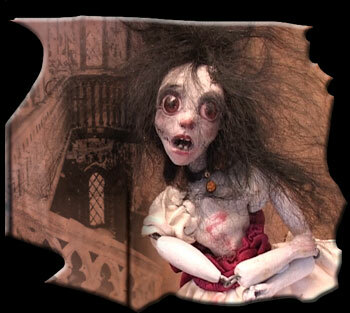 Cross also purchased a Voodoo Queen doll from Pustanio and she claims that it is haunted as well. Pustanio claims that only his talent and nothing magical or ghostly went into the creation of his dolls, but many still believe them to be possessed by something unexplainable and bizarre. It is interesting to note that Pustanio’s previous forays into other forms of art over the past 15 years, including painting and sculpture, are rumored to have something of the supernatural about them. Besides his online store, Ricardo Pustanio recently allowed his Devil Baby dolls to be placed on eBay for auction as an initial showing from a large collection of New Orleans-inspired artwork. One Devil Baby doll has already changed hands on eBay several times; it seems the old saying “buyer beware” was never more appropriate! Ricardo Pustanio’s Devil Baby dolls, haunted or not, are in high demand. Each is one of a kind and can be made to order and dressed in baby clothes the purchaser supplies. Other dolls by Pustanio include Voodoo Queen dolls, Voodoo Zombie and Lwa dolls, and Voodoo You dolls made by the artist to look like any person the buyer wishes. Check into Pustanio’s haunted handiwork at www.ricardopustanio.com or at www.thehouseofvoodoo.com where you can also purchase dolls by other local artists. As soon as Mandy arrived at the museum, staff and volunteers began to have weird and unexplainable experiences. Lunches would disappear from the refrigerator and later be found tucked away in a drawer; footsteps were heard when no one was around; pens, books, photos and many other small items would go missing – some were never found and some turned up later. The staff passed these events off as absent-mindedness, but this did not account for everything. Mandy did not have a permanent “home” inside the museum when she first arrived. She was placed in the museum entranceway, facing the public, and visitors would stare and talk about the doll with the cracked and broken face and sinister smile. Eventually, Mandy was moved to another part of the museum where she was carefully placed alone in a display case because museum staff had been told that she should not be placed with other dolls because she would harm them. Some visitors are very disturbed by the doll’s eyes, which they say appear to follow them around the room. Others claim to have seen the doll actually blink, and still others say they have seen the doll in one position and minutes later she will appear to have moved. Although they’re used to it by now, museum staff and volunteers still prefer not to be the last one working or locking up the museum at the end of the day. This is a terrifying case of a raggedy Ann doll named Annabelle. The case is from the 1970’s and is highlighted in the book The Demonologist. This is one of the Warrens most asked about cases. The referral came from an Episcopal priest. A somber toned clergyman told Ed Warren of two young nurses who had communicated with what they thought to be a human spirit. One of the girls’ friends had been attacked physically, and the activity was still in progress, so Ed accepted the case. With that the priest gave Ed the phone number of the girls. 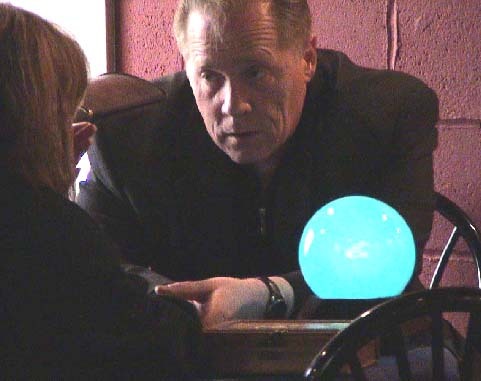 Ed immediately called the number and upon reaching one of the girls, Ed verified the existence of the problem and told the young women that he and Lorraine were on their way. Can a child's doll really be haunted? Pupa The haunted Doll might just be the real thing! As a dedicated paranormal investigator I have been investigating for about 12 years now and experienced haunted doll paranormal activities. I don’t have to go out in the field as much as before. I concentrate now on haunted doll and doll items. For some reason, dolls seems to attract more spirits and paranormal haunted activities then other inanimate objects. At Least that's what my findings have begun to reveal. This print is from an engraving, dated 1890. 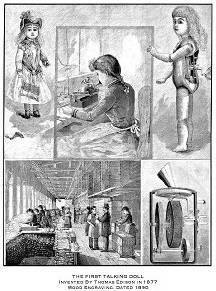 The print illustrates the recording process, manufacturing and assembly stages of the doll, and a close-up of the actual recording mechanism. Invented in 1877 and introduced to the public in 1890 by the Edison Phonograph Toy Manufacturing Company as a toy that they could purchase. Technically, the doll was an historic step in phonograph history — the first phonograph marketed for home entertainment. The doll contained a six-second prerecorded cylinder that contained a six-second recording of a nursery rhyme. 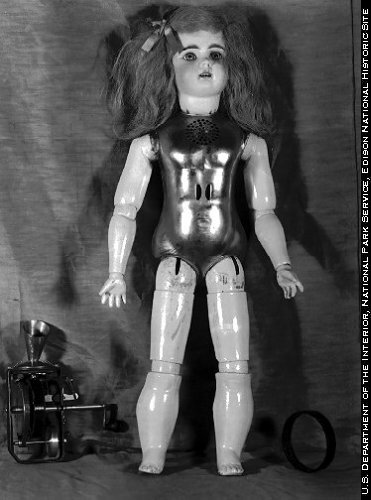 The doll stands 22" high and weighs four pounds, with a metal body, articulated wooden limbs, and an imported Simon and Halbig #719 bisque head. The internal phonograph measures only 7" tall, with a wax cylinder measuring 3" in diameter and 5/8" wide. The original price was $10 with a simple chemise, and $20-$25 with full dress. This was a huge sum for the time, equal to about two weeks salary for the average person. Cylinders were not interchangeable. There was no spring motor so the child was expected to turn the crank by hand at a steady speed in order for the doll to recite the nursery rhyme. (Edison was later quoted as admitting that “the voices of the little monsters were exceedingly unpleasant to hear.”) Unfortunately the delicate mechanism was too fragile for rough usage, and the steel stylus caused the wax record to wear out extremely rapidly. Print No. 25931. February of 1891: "One of Edison's talking dolls has reached Winnipeg (Canada.) It is at Miss Maycock's store and is inspected daily by a large number of people. It is a very good evidence of the uses to which the phonograph can be applied, but as a conversationalist or an elocutionist, the doll cannot be pronounced a success. The piece which the manufacturer has arranged for the lifeless talker to say is that familiar old nursery rhyme, 'Jack and Jill.' When the crank is applied to the mechanism and turned, the sound is emitted from a perforated plate on the breast of the doll. At first it is hard to distinguish any words, but by listening attentively and following the rhyme from the start, every word can be heard although not distinctly. As a novelty it is interesting." Do you need help in dealing with a real haunted doll that haunts you? "I personally don't trust these objects that are supposedly haunted or possessed by a real ghost. I prefer that they are not being shown in public", she states. "Many strange things can be triggered even by looking at the photo of a real haunted doll, I believe it can sometimes trigger paranormal activity by those that look at these supposed ghost photos." "The same goes for reading about such things even if they are not true. "It effects someone," she states.